What a brilliant space to hold an exhibit. The Mining Exchange building in Ballarat is one of those architectural delights that you just keep stumbling on in the old cities and towns of regional Victoria. Ballarat has some truly beautiful buildings, and is about one good city festival away from more significantly stamping its identity onto the broader cultural consciousness of Australia, in my opinion, if it so desired to. The abundance of natural light, the solid structural volume of space and the high ceilings make this an epic venue. Possibly as a result of this overawing framework, or maybe just in spite of it, the setup for displaying the graduates’ art was pretty disappointing (not the art, the presentation of it). Concertina-style white boards, zig-zagging across the space is more befitting of a trade show than an art exhibition. 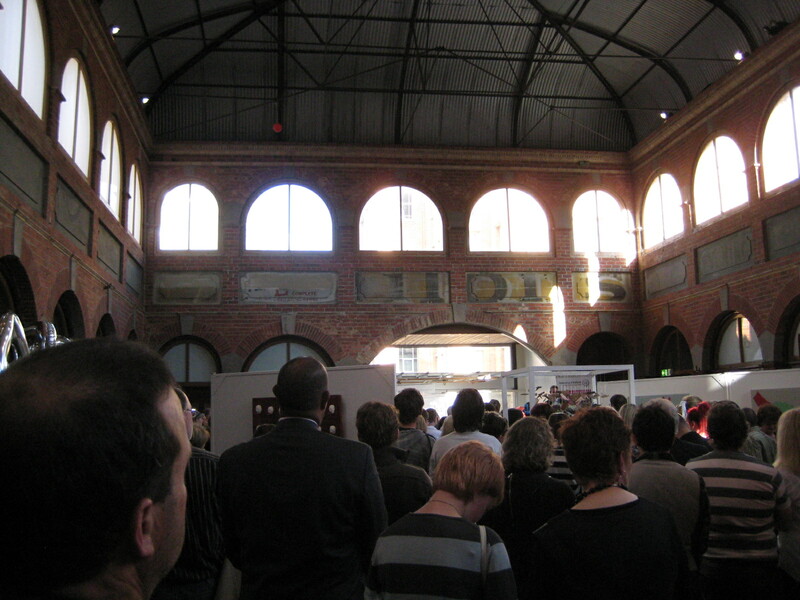 This is probably a harsh criticism, given the sheer volume of work that needs to be displayed in these exhibitions, but in contrast to the La Trobe GradShow, which admittedly had the advantage of being actually in an art gallery context, it was definitely less impressive – as a curatorial enterprise. This is not an opinion on the actual art, let it be clear. It’s also possible that my first impression was tainted by the fact that someone kept incessantly ordering the audience, in a very authoritative manner to ‘come up to the front’, like the audience were ill-disciplined children to be herded by a booming PA voice. So, having vented that, let’s turn to the true interest here anyway – the art. There was a lot to take in, so in these situations it’s often a matter of drifting through, smiling politely at everyone you bump into along the way, run your eyes over the works and wait for the stronger ones to come rushing off the walls and into your brain. The first pouncer was a series of paintings by Louisa West called White Void:Chiaroscuro. 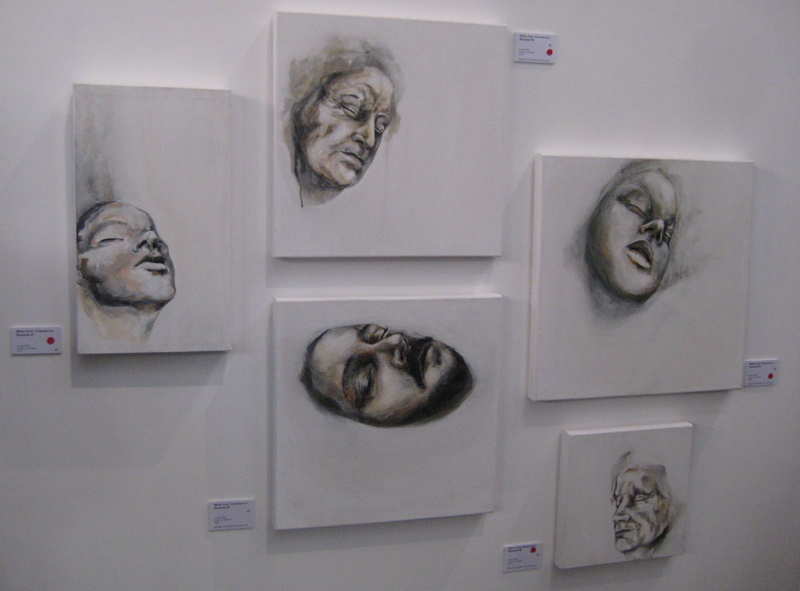 Images of faces in open white voids, as if falling into the space of sleep or death. Displaying a nice balance of a developing painterly skill and conceptual insight, the series of works also evoke a collective connection. The watery drips on some of the faces speaking of decay, tears and death. The closed eyes also somehow, and oddly, intensifying the attention on the physical features – the nose, ears, and even the eyes themselves. The white void hinting at a presence of absence, rather than complete emptiness, and amplifying the dreamy nature of the work. A large-scale artwork by Caroline Broome, Mooka, crept out from the wall and made a presence for itself. Abstract in nature but slipping into figuration and landscape, like a giant wobbling organism, it continued to play on your mind with each look. The colours evoked bodily forms, thighs and lips and bended arms, fracturing into ochre rock and rich iron soils. The confidence of the work, its scale and its boldness, is rewarded by its resulting impact. Kelly Brett’s use of animal motifs mashed with 80s style neo-expressionism (retro-neo-expressionist-post-modernism?) were graphic and well-composed. 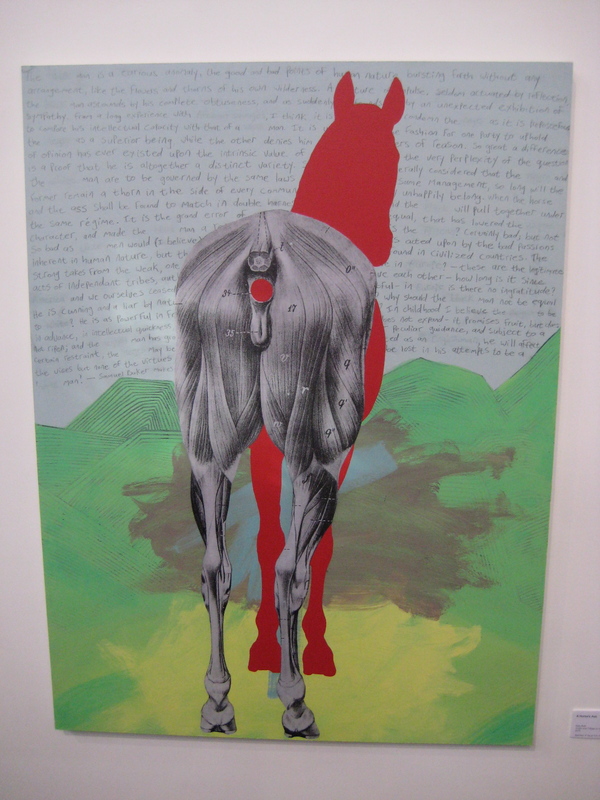 Clever use of colour and mixed media lifted the works out from the walls, with subtle interplays of meaning adding weight. The animal subjects portrayed like solitary, lonely symbols, but also as fragmentary pieces of meat barely holding together – gently prodding thoughts to hunting and species extinctions (especially with elephants and giraffes included). One work that took a couple of viewings to really warm to, but kept playing on my mind, was Kate Gorman’s Interior Growth Model I (Objects from Installation). 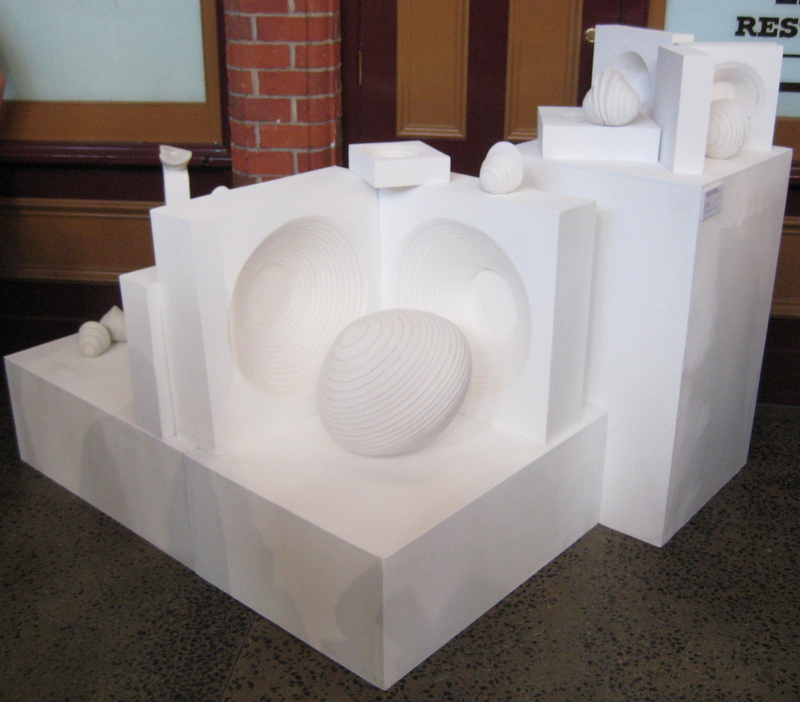 Objects created from the framing devices of art presentation – plasterboard and plinths – interestingly engaged with the very idea of presenting art. These presentation devices becoming artworks, their essential interiors carved out and repositioned. The inner spaces pulled out and transferred from negative to positive space. 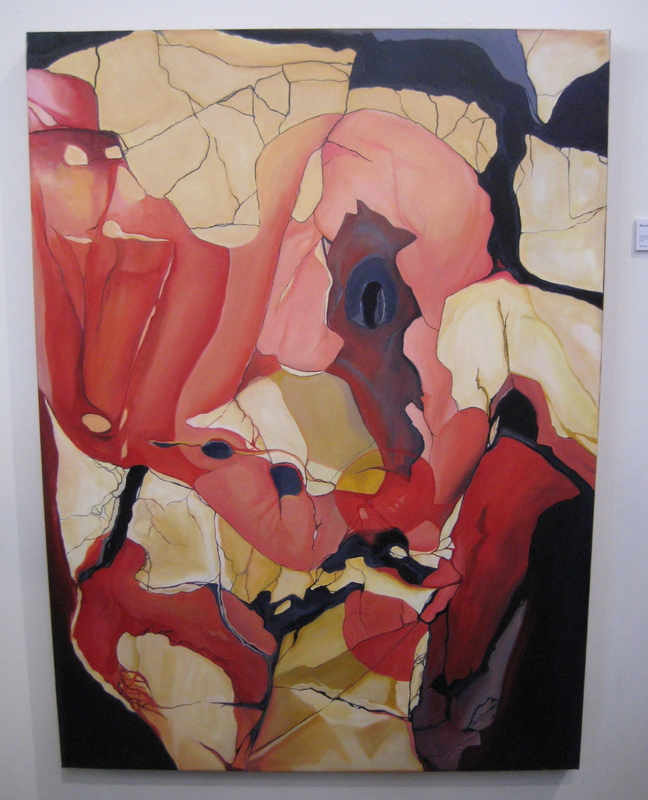 Finally, another work that gathered momentum with each view was the abstract painting of Brock Sibley. It takes a certain talent to be able to paint this badly, and still make it interesting. And I mean that in a truly complimentary way. After all, Picasso said it took him years of effort to finally be able to paint like a child again. There’s a sort of innocent directness you can achieve with this sort of painting and it’s not easy to acquire without it actually ending up like a mess. To paint freely and still maintain some sort of depth to the work (not perceptual depth, just depth) is no easy task – see Albert Oehlen for an example of genius in this area. Sibley’s overlays of scribbles, paint patches, lines and blobs really managed to hold their own, on the precipice of falling into a chaotic mess – not unlike life itself really. Overall there was a lot of potential talent on show, including some interesting ceramics works by Mathew Briscoe and Lisa Tripp. And to the credit of the art school there was an apparent abundance of awards and prizes to help support the artists as well. If you get a chance, it’s definitely worth a look, including the exposure to works by the other creative disciplines from the fields of graphics and design. The show runs until December 4. Tags: University of Ballarat. Bookmark the permalink.